I’ve got another great football appetizer for you! Go to the grocery store and prepare for all of the football games this weekend. Just make sure to get all of the ingredients for this one. It is a refreshing and healthy break from all of the fried foods, pizza, and buffalo wings. You can prep this one the night before and serve it right out of the refrigerator with toasted baguette slices that are quick and easy to make. Or top the bread with a spoonful of the bruschetta mixture and a little cheese, then throw in the oven until cheese is melted and bubbly. This recipe will also improve just about any dish you are making. Add it to baked chicken, top a salad, add to mixed veggies, or simply serve as a salsa or pico de gallo with some fresh tortilla chips. Whisk together garlic, vinegar, salt, pepper, and basil. When combined add in olive oil. Add tomatoes and refrigerate until ready to use. Place the sliced bread on a cookie sheet and spray bread with nonstick cooking spray. Turn broiler on high and broil bread for 1-2 minutes or until lightly browned and toasted. Make sure to watch them closely! They will turn to charred bricks very quickly! 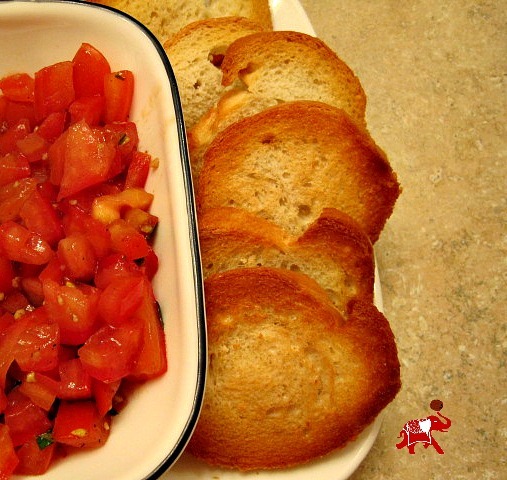 Remove from oven and serve with cold Bruschetta for a light and refreshing appetizer. 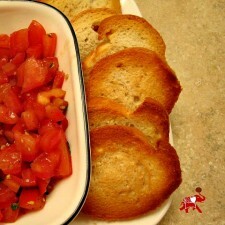 Place sliced bread on cookie sheet, top with bruschetta mixture and sprinkle a little cheese on top. Broil on high until the cheese melts. Again, watch this closely so they don’t burn. Enjoy!